After a fabulous time in Nha Trang, soaking up some sunshine and catching up on some well overdue R + R we headed to Hoi An. Vietnam had slowly become my favourite place so far during our travels which surprised me as I already fallen in love with Cambodia after Siem Reap and our trip to Angkor Wat. I didn't think too much to Ho Chi Minh, with it's busy streets,the hustle and bustle and the same vibe I got from Bangkok (a place I have now visited more than once and still can't come to like the place despite a better experience from Khao San Road this time). Nha Trang was much needed - sunbathing, mud spas, smoothies, good food and lots of fun. The place is absolutely beautiful - a lantern lit town (finally, a place where I don't feel unsafe on the roads! ), separated by a river running through. 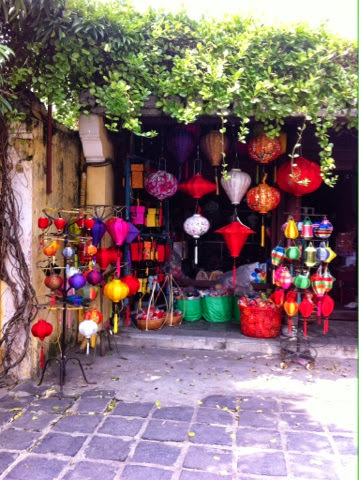 The buildings, despite appearing old, are painted and almost 80% have bright, handmade lanterns (Hoi An is famous for these!) hung outside. I do think lantern appreciation is more of 'a girl thing' as the boys couldn't quite agree how 'cute' the place is. 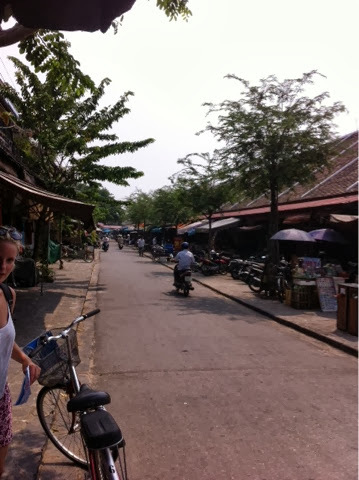 Hoi An has so much character and is like nowhere we have visited until now which is why I found it so special. We only spent one and a bit days there due to running out of time but I would definitely recommend 2-3 days. The second thing Hoi An is famous for is tailoring and I would 100% recommend getting your own clothes made here - I had three beautiful, well made dresses made here for 20 USD each (an absolute bargain for good quality fabric and pretty near perfect fit). The choice of fabrics is ridiculous - there are hundreds, so do make sure you set aside plenty at least a half hour to an hour gap to choose carefully. They have endless designs to choose from, for men and women - dresses, shorts, playsuits, high quality suits and ties (JT would be content) - and it's all super cheap for the quality and fit. Convinced yet? WELL, if that hasn't convinced you, almost every tailor offers the option of shipping your clothing back home or, if you're backpacking, to your next or final travel destination. We stayed at the Hoa Binh Hotel, which had an excellent location with a 5-10 minute walk to the riverfront where all of the shops, boats and restaurants are. We chose a superior room which included and ensuite and two big double beds (conveniently fitting 5 of us in). This also included a free buffet breakfast each which was actually pretty good - fruit, cereals, eggs, pancakes AND omelettes - everything to set you up for the day. There's even a small indoor swimming pool, should you require it...which you may do after my next suggested activity. My 'must do' in Hoi An, other than having clothes made is hiring a bicycle, The best way to see Hoi An and appreciate the lovely little town is by cycling around, meandering through the streets, crossing the river to the island, getting lost in the Old Town and cycling down the loooong road to the beach. 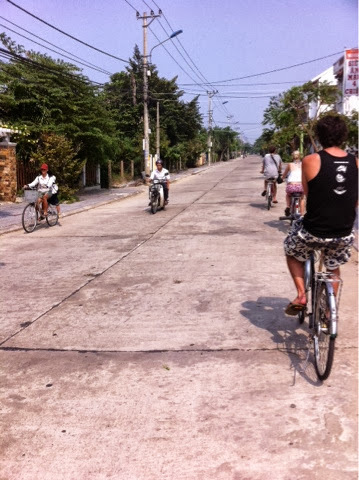 Opposite Hoa Binh Hotel is a bicycle hire shop, $2 a day per bike - see why it's a must do now? Not only is it cheap, it saves you time, saves your feet and is pretty fun. That evening we made our way to the riverfront, crossed over the Japanese style bridge and ate at a restaurant overlooking it all. There are a lot of restaurants down there, all with very similar menus, prices and quality so I would recommend picking one with the best drinks offers - these will usually already be up on board somewhere but they're often open to a bit of haggling if there's a group of you. The next morning we got up early in search of the markets in the Old Quarter, The one close to the crossing to the island is okay but quite local, if it's jewellery, art, chopsticks - all that kinda stuff, head a little further a long down by the river (to the right of the bridge) and you'll find it all down there. Unfortunately, our morning was a big rush as we had to catch a 1,30pm bus to Hanoi - 3-4 hours on a minibus then 17ish on a sleeper bus. Yep, ridiculously long journey but it's the most cost effective way to do it and saves on a night of accomodation. They aren't completely horrible but they're not 5* luxury so don't get your hopes up too much. 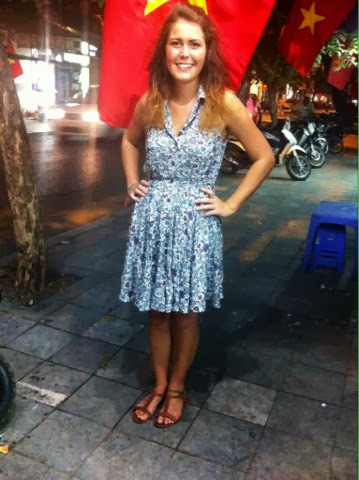 Stay posted to hear about my Hanoi adventures - it's an interesting place!